the theoretical framework of Universal Design for Learning (Rose & Meyer, 2002), teaching the same material via various strategies that cumulatively address needs and learning types of each student in the classroom (p. 126). acknowledge all the various types of learners in his class, such as visual learners, auditory learners, write-read learners, and kinesthetic learners, following Gardner’s (1983) multiple intelligence theory. Students need to organize recently acquired knowledge in a strategic way and communicate their understanding to the teacher. Rose and Meyer (2002) created a detailed pathway for teachers to apply UDL using assistive technology. barriers to digital & media literacy competence. Journal of Media Literacy Education, 9(2). p. 128 Media production is the process of composing a message via a single or various media platforms. 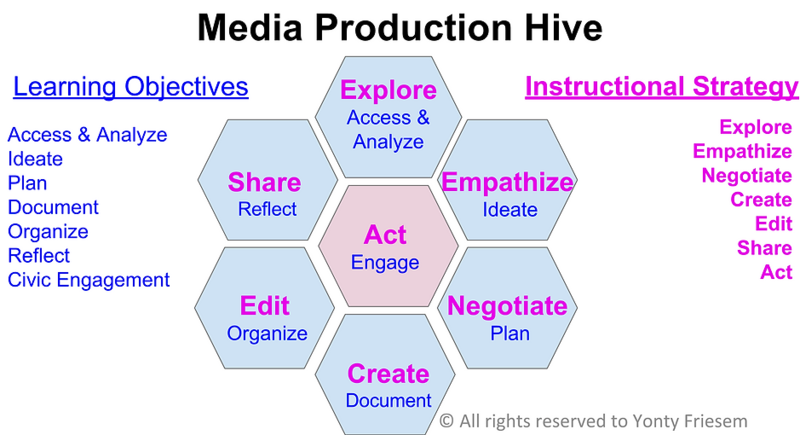 Media production includes creating videos, podcasts, presentations, posters, drawings, and books. With the increasing use of digital devices and applications, students are engaged in various ways to convey their messages using multiple ways of expression and multiple types of representations. Group dynamics often reveal power struggles among team members (Friesem, 2014). The responsibility of the media educator, who is not a mediator by training, is to find the way to mitigate the tension caused by differences among group members (Friesem, 2010). In addition, students have the tendency to use media production as a transgressive practice (Moore, 2011; Grace & Tubin, 1998). Facilitating the process of production involves constant reflection on the classroom power relationship using critical and pragmatic lenses. in the elementary classroom. In D. Buckingham (Ed. ), Teaching popular culture: Beyond radical pedagogy (pp. 42-62). London, UK: University College London Press. The discourse about the implementations of UDL with digital technology has been broad and used for several research studies (Rose & Meyer, 2002). design for learning. Alexandria, VA: Association for Supervision and Curriculum Development (ASCD).